Also called “dancer’s hip,” snapping hip occurs frequently in young, active individuals. The snapping sensation is usually more annoying, but if it progresses it can become painful and limit performance. Snapping is most commonly felt at the outside of the hip but can also be felt in the front. It typically occurs with hip flexion, such as squatting or sitting into a chair, and can also be felt with hip extension, such as standing from a chair or lowering the leg during a leg lift. The hip joint is a ball and socket joint that attaches the femur to the pelvis. It should move freely in all directions. The deep socket and numerous muscles and ligaments surrounding the joint make it very stable. 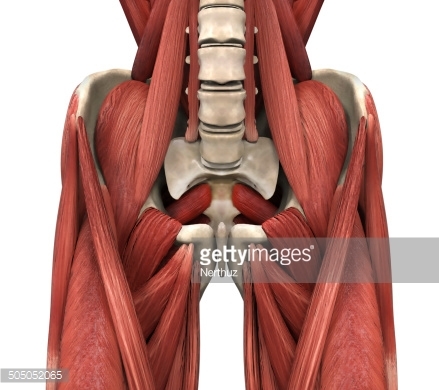 From the photo above, you can see that there are many muscles that attach in close proximity to the joint. The “snapping” in the hip is often times caused by a tight muscle passing over a bony prominence as the leg moves. The most important part of diagnosing a snapping hip is determining which muscle is tight, and why. The underlying cause could be anything from the way you sit or stand to the way you go up and down the stairs. Physical therapists are experts in analyzing movement. Through their exam, they can determine if you have existing muscular imbalances that could be perpetuating the condition. Once they are determined, they will design an exercise program specific to you that is meant to correct these imbalances and achieve your personal goals. In addition, they will implement manual therapies to decrease restrictions found in your muscle tissue or joint. At the end of your treatment episode, you will be able to move better, more efficiently, and without pain! Please click here or call 646-875-8348 to schedule your one-on-one initial evaluation today!